Bristol, UK September 28th, 2018. 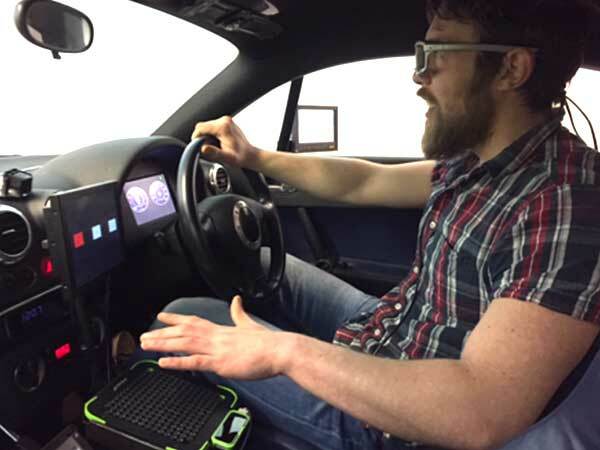 Emerging automotive interfaces could make driving safer by significantly reducing ‘glance time’, a study by technology firm Ultrahaptics and the University of Nottingham has found. The study compared a new automotive interface, for controlling environmental features such as music and air conditioning, to the current use of touchscreens. It was found to reduce errors, cut time spent with eyes off the road by up to 25%, and to be preferred by users. Nearly 40% of users were able to perform tasks without taking their eyes off the road at all. Mid-air gestures were combined with mid-air touch feedback to simulate the tactile presence of buttons and sliders on the user’s hand, without the user having to physically touch any controls. The study, Exploring the Use of Mid-Air Ultrasonic Feedback to Enhance Automotive User Interfaces, was awarded ‘Best Paper’ at the Automotive UI conference in Toronto on 24th September 2018. The paper centers on comparisons between popular touchscreen technologies and emerging gesture recognition systems, which were first launched in cars on the market in 2016. Gesture recognition systems use 3D sensing technologies to enable drivers to control multimedia with the wave of a hand, or by performing a hand gesture. Ultrahaptics’ mid-air touch technology was added to gesture recognition in the study to produce the feeling of touch (termed ‘haptic feedback’) by projecting ultrasound waves onto the user’s palm and fingers, creating tactile points of pressure which the user could feel. 48 participants took part in the study, each completing four simulated drives in a specially adapted Audi TT chassis in front of a curved screen. Each drive featured different types of in-car interfaces: a touchscreen without haptic feedback, a touchscreen with mid-air haptic feedback, gesture control without haptic feedback, and gesture control with mid-air haptic feedback. The researchers tested two different types of interactions: a slider bar and button presses. User experience was measured across a whole spectrum, including eye-tracking (“eyes off the road” time), accuracy and efficiency, and participants’ subjective assessment. Results from the study suggest that adding haptics to gesture control reduced both the total and the mean glance duration times (or “eyes off the road” time) for both button and slider controls. The effect was most distinct in the slider task, with gesture control plus haptics resulting in an average 25% decrease in total glance time compared to touchscreens. The mean glance duration was under two seconds for mid-air haptics for both buttons presses and slider bars. The study concluded there was three times greater accuracy on the slider task when using gesture control with haptics compared to a touchscreen. Speaking of the findings, Ultrahaptics’ Director of Research, Dr Orestis Georgiou commented “These numbers are not just an incremental improvement, but potentially a massive shift in safety. Driver distraction and safety are central to in-car controls, and distraction costs lives. Half a second cut from a driver distraction interaction at 70mph means your response to an incident will come 15.6 meters sooner. By significantly reducing glance time these technologies pave the way for a revolution of next generation, safer, easier to use interfaces. This study was a great example of collaboration between industry and academia, and we were hugely excited to be recognised as ‘best paper’ by the Human-Machine Interface industry experts at the ACM Automotive UI Conference”.